I’m a big fan of traditions…Huge. By next year I’m hoping to add a volunteer activity to our family traditions -- we already “adopt” a family each year to buy gifts for, but I'd like to also volunteer somewhere together. I'd also like to pick a homemade treat to give as our “signature” gift. My vote would be for spicy/sweet nuts or a yummy chutney or something, but I know the girls will clamor for cookies. Have you seen this incredibly cool feature on Gourmet’s website? 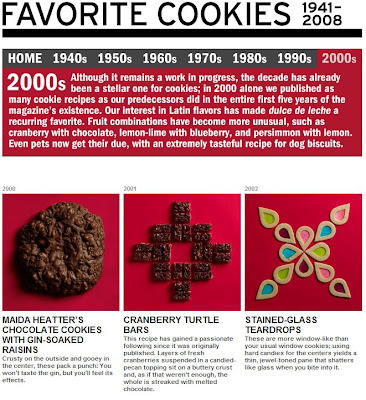 It chronicles the best cookie recipe from each year of Gourmet’s history (I loved the cookies from the 2000s the best)…Very, very neat. So what are your holiday traditions? Please share! That feature is so fun! Thanks for sharing. Our big tradition is making gingerbread houses from scratch. We do a huge party in the beginning of December and it's a bigger deal than Christmas in our house - just a fun way for everyone to get together without as much pressure. Oh my, oh my sweet goodness, I think this year my sweet tooth will just mutiny and take over all the teeth and I will be forced, by tiny teeth soldiers, to eat cookies all winter long...yikes. yum too bad I can't eat cookies! Ok- our tradition is we let each kid invite there best friends over to make cookies for a few hrs, decorate them and then they deliver them the next day(all family) when dry to an old-folk home-- together. They all sing xmas songs as they go in the rooms and we brighten the old-folks day for a long while! They all love it. it is priceless. AND YES, Audrey will be invited! Millie too!! hope you can make it! will keep you posted. wow, this is the greatest thing i've seen in a while! I love traditions! On Christmas Eve, we make a fancy dinner & invite a few close friends over. I always put a Christmas cracker on each plate. Before we eat, we crack them open & put on those silly paper crowns that are always inside the crackers. Dinner is always much more fun & magical with candlelight & paper hats. Christmas morning, after presents, I make Swedish pancakes with lemon & jam & a big pot of coffee. Then we bundle up & take a long walk in the woods near our house. Heaven! I love this thread. I'm always so curious what traditions other people have. I can't tear myself away from this gourmet article! 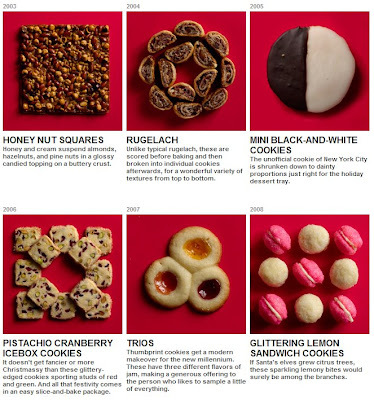 How fun would it be to try and bake every recipe between now and Christmas? As for traditions, I can't wait to visit my parents for our annual gingerbread house decorating contest! Oh, me too....I adore all of the traditions of the holidays. Those sound like lovely traditions you are starting....*sigh* What a wonderful time of the year!